The past year has brought quite a few challenges to the internal operations of Sampson's Prosthetic & Orthotic Laboratory. Due to external changes in the insurance world, our prosthetic & orthotic industry has had to quickly assess internal policies and procedures and make changes to adapt to deepened medical documentation requirements. Sampson's has been in business in Schenectady for almost 40 years. The insurance business has drastically changed since we first started and significantly for our practice in the last three years. For example, both Medicare and Medicaid, commercial companies like CDPHP, MVP and Empire BC/BS are now demanding specifically-written medical notes from our office justifying both the costs of the device and the patient's specific functional needs to that specific prosthetic or orthotic device. Over the years, Bill Sampson, CP, had begun to position the company to do this with electronic medical charts and component purchasing software. We are now moving rapidly to gather the additional documentation from referring physicians such as surgeons, primary care doctors, cardiologists, vascular specialists, physical therapists and other medical professionals. Getting medical documentation from other physicians has created a real challenge for our office and also for this industry nationally. Not all patients were or are seen by other physicians on a regular basis and/or we have received documentation that lacks any reference in the medical chart to our patient's being an amputee or why functionally a patient needs a particular orthotic brace. 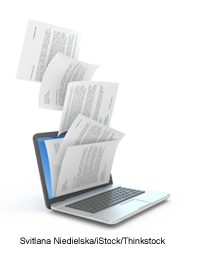 To align our office to meet these challenging documentation requirements to get our claims paid, we have implemented a new software called OPIE, have hired and trained new staff, and have made strong efforts to retain the knowledgeable and experienced staff that have been employed here for many years. You may have noticed our red signs on our doors in Schenectady alerting you that these changing requirements mean that we cannot operate the same way we used to. You now may be asked to bring a new prescription from your doctor if your current one on file is expired or does not clarify the new type of service you need from our office. You may be asked to bring recent medical records from your referring doctor or other medical professionals you visit, which must contain a description of your prosthetic or orthotic functional needs. You may be asked to call your insurance company to investigate the delays on payment of your Sampson's claims or insurance authorization to provide your device under your health care plan. You may be asked to make a follow up appointment with your referring physician after your initial evaluation with a Sampson's clinician so that the medical documentation is corroborated between our office and your referring physician. 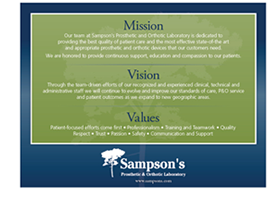 With these internal changes and our patients' understanding and support, Sampson's is building a new business foundation. This foundation needs to be strong and compliant to ensure continued excellent patient service, appropriate and timely claims payments and a long future in the Capital Region. 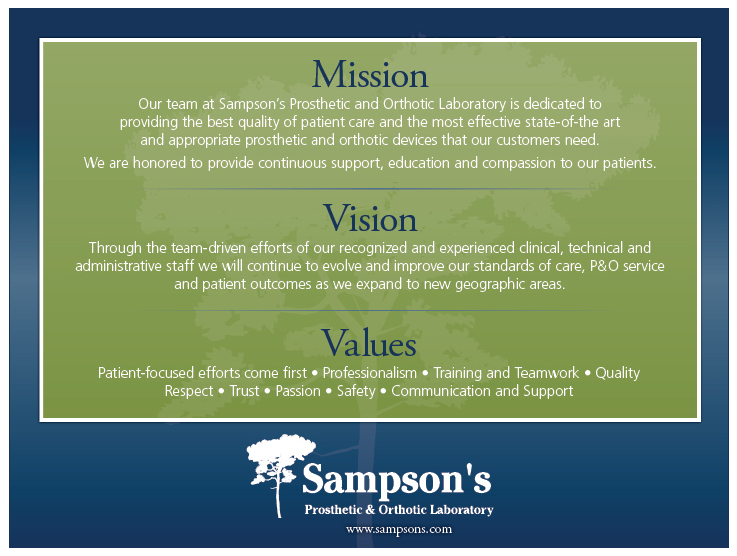 For more than 40 years, Sampson's practitioners and staff have provided rehabilitation care. Bill Sampson, CP, recognized those employees who have completed 10 years or more of service at a company picnic in early fall. By providing excellent patient service and custom fitting and fabricating, they have helped their patients enjoy a better quality of life. Gary Morey, Technical Lab Director, has been with Sampson's for 25 years. Gary has worked with founder William Sampson and now current president, Bill Sampson. Gary oversees the fabrication lab in Schenectady and is responsible for the timely production of each custom made prosthetic or orthotic device. He has been a tremendously valuable and reliable employee. Gary is an ABC-certified technician in orthotics and a certified prosthetic assistant. Also working closely with Gary in the lab, is Ram Lokie, CTO. This autumn Ram celebrates 20 years with Sampson's. He is responsible for custom-made orthotics. Ram's calm, committed and focused demeanor represents the true asset he has been to our company. Not far behind Gary and Ram, and also in our technical lab is Sidnath Bassoo holding steady with 19 years and Robert DeSimone with 15 years. 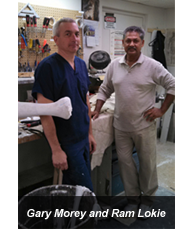 Sid works on prosthetic fabrication and Robert both prosthetics and orthotics. On the administrative side is Chris Pierce, front desk supervisor 14 years and Pina Woods, billing supervisor, 10 years. Chris and Pina's presence at Sampson's cannot be overlooked. Both bring years of industry experience, familiarity with our referring sources (AMC, Sunnyview, Saratoga Hospital, Glens Falls Hospital and our many referring doctors and groups) and also our myriad of payer paths, their requirements and claim payment demands. Since the beginning of this year, Sampson's has hired several new employees who you may have seen in the office or spoken to on the phone. In January, Sampson's Prosthetic & Orthotic Lab said goodbye to Amy Osborne. Amy had been employed here for 18 years and had accepted another position as a healthcare program director in central New York. She began at the front desk, worked her way through billing and eventually was the practice administrator. Amy was replaced by Dianne Kiernan, MMHS, MST, as the new practice administrator. Dianne brings experience from government healthcare programs and compliance, commercial payers, and a private physical therapy practice. She brings a unique perspective and fresh eyes to the administrative direction of Sampson's as the company adapts to new and broader documentation requirements. Dianne is responsible for daily operations, human resources, financial analysis and facility management. Dianne lives in Saratoga and is the parent of three teenagers. In April, we welcomed Bonnie Zone-Mitchell, LPN, as the new patients' collections representative. Bonnie quickly reorganized the patient statement policies and procedures and assists in the large payer collections and billing supports. This summer, Bonnie was also nominated as the company's compliance officer and will assist in the ABC three-year reaccreditation process that began this autumn and concludes April 2014. Bonnie previously worked at Albany County Nursing Home and is a certified medical biller and coder. We also added talent to our front desk and billing departments. You may have spoken to Christina Lane when calling in to make an appointment in Schenectady or one of our branch offices. 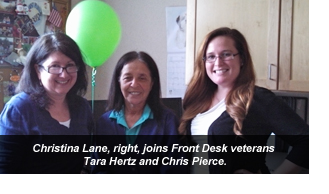 Christina brings a smile, youth and enthusiasm to our front desk working alongside veteran receptionists, Tara Hertz and Chris Pierce. Christina is pursuing an associate's degree in accounting and has experience in medical billing and coding. In August we expanded our intensely busy back of the house with the hiring of Sarah Schaible. Sarah is also a certified biller and coder and recently worked the accounts receivables for Ellis Hospital. She is working on the billing team with Chandra Sooknanan, Linda Lawrence and supervisor, Pina Wood. All new staff are experiencing training and cross-training activities within Sampson's and are willing and ready to give you the best service and information as we go through major payer demands. Please say hello and welcome aboard when you speak with our newest staff. This spring, after much discussion and collaboration with its staff, Sampson's revised its Mission, Vision and Values Statements. "Our goal was to develop mission, vision, and values statements that more accurately reflects what we work tirelessly to achieve, and that is the successful rehabilitation of our patients," said Bill Sampson, company president. "Our mission declares our purpose as a prosthetic and orthotic care provider and our values guides every aspect of our practice. Our vision is our long-term goal of delivering our skill and expertise to an ever-widening group of patients. "Our staff put much thought, time and effort to crafting these statements that show who we are, where we want to go, and how we will accomplish that." 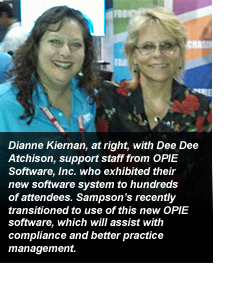 Sampson's Practice Administrator, Dianne Kiernan, attended the American Orthotic & Prosthetic Association (AOPA) World Congress held in Orlando Sept. 18-21. Dianne met with many orthotic and prosthetic vendors who were exhibiting components and products over the three-day conference. She also attended the General Assembly and several business workshops. The General Assembly was represented by many international companies and clinicians who work on new biomechanical techniques and also provide services to those in need in Haiti, Mexico, Vietnam and other less developed countries. Business, technical and scientific workshops were held continuously and simultaneously throughout the conference. Dianne attended the business seminars to learn more about managing and preparing for the various types of Medicare audits, marketing, business valuation and new industry software.